In the states and missing Mexico? 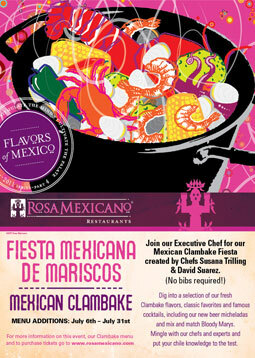 Here's event information for a Mexican-style clambake this week, starting as soon as July 13, in different locations across the U.S. As the web site suggests,"Dig into a selection of our fresh Clambake flavors, classic favorites and famous cocktails. Mingle with our chefs and experts and put your chile knowledge to the test. Reservations are required so make sure to go to their website for details. As they say in Spanish, ¡Que aproveche!